I often forget how fabulous the Nihola is because it is part of our every day. Recently, several mothers have asked me what it’s like to ride. The ride itself is quite smooth. However, because we are on three wheels we tend to be a bit slower than our two- wheel brethren, despite the electric motor. I chose a tricycle four years ago because balancing two kids and gear on two wheels has always felt perilous to me. 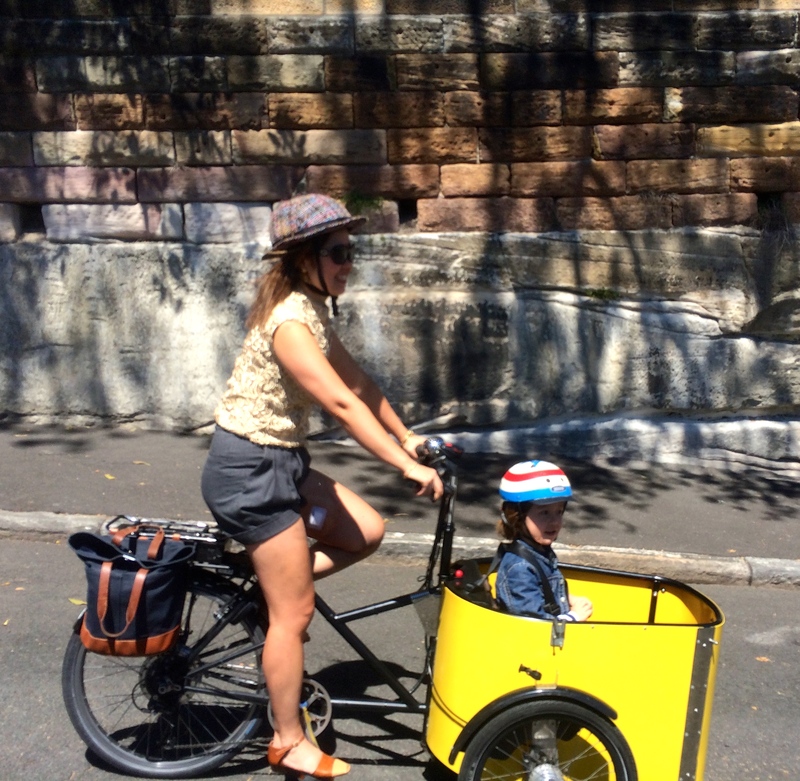 I’m sure that if I rode my husband’s Yuba Mundo more often, I would get used to it. However, returning to to cycling via the Nihola gave me a much-needed-boost of confidence to start cycling again. Riding down Observatory Hill on the way to lunch! The Nihola has a throttle for the motor on the right handlebar. It’s the black ridged section next to the grip. The right brake controls the back and the left initiates the two front brakes. The two front brakes provide the greatest braking power. Squeezing the back brake too fast can result in brake lock-up. However, using them in tandem is very effective for fast braking. When braking, I always let go of the throttle. 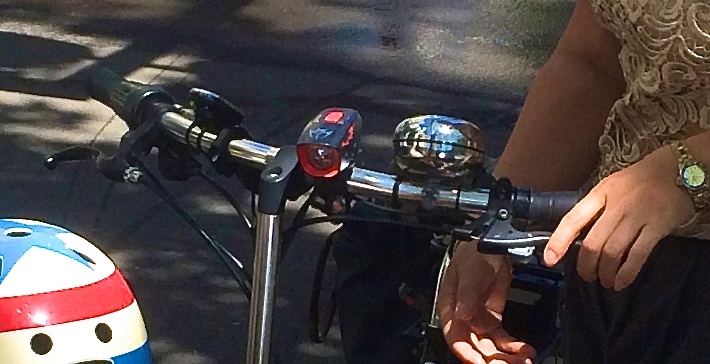 A “ding-dong” bell, speedometre, odometre, and light attached to the battery complete the “real estate” on the handlebars. Starting from the left in photo, is the grip, brake, throttle, speedometre/odometre, light, ding-dong bell, brake, hands-free brake knob (which locks front brakes), grip. Early autumn in Sydney is quite beautiful and warm. I thought I would wear a lace top and wool shorts today. I went to the doctor after Julius’ lesson to check on my mountain bike wound. It’s healing nicely. 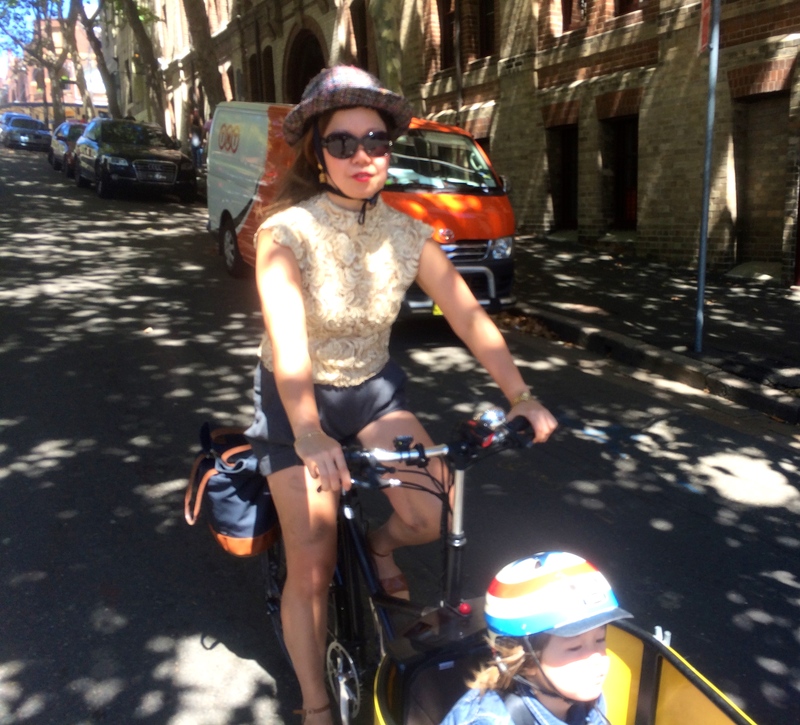 We decided to ride up the Kent Street Cycleway to go the long way to lunch in Walsh Bay. It was a great opportunity for Justin to clear his head, stretch his legs and have a bit of fun with us after a busy morning at work. To commence riding, I twist the throttle with my right hand and pedal. The motor makes a distinctive “vrrrr” sound. I twist the throttle for as much power as I need. For very steep hills, I twist the throttle fully and stand up. To go downhill, I use it to start. The motor shuts off after reaching 25 km/hr. Going downhill with a fully loaded cabin (2 kids who weigh nearly fifty kilograms) ensures the best and most stable ride. We have gone as fast as 50km/hr fully loaded. Eye-watering! An empty cabin is less stable and requires a firm yet flexible grip on the handlebars. I slow down when the cabin is empty or contains only Julius. I have made turns on two wheels. I’ve never tipped over but I’m not overly keen to try it. Slow turns and slow descents with only Julius are best. To ensure that we have enough power for the morning and afternoon drop-offs, I charge the battery every other night. I have two which gives us a range of about seventy kilometres. The rain cover and it’s frame live under the seat with a blanket (for unexpectedly cold children) and an Abus lock. It’s an uphill climb from the bottom of Kent Street to the Rocks. But with the Nihola’s electric-motor-boost, it’s not a problem. Justin had to work to keep up (and film us ascending). We enjoyed some dumplings for lunch and then it was time for Justin to return (sadly) to work. 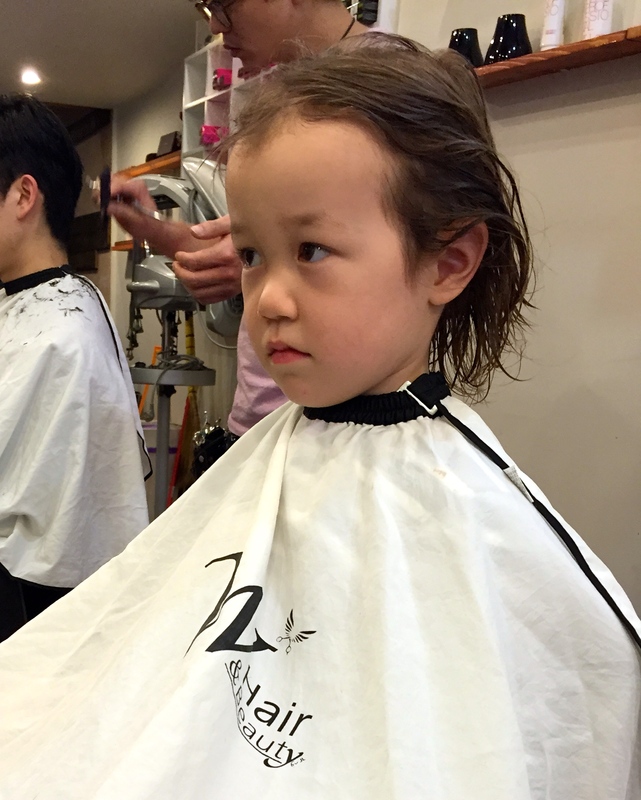 Julius had an appointment with our stylist in Koreatown. I’m keeping his hair long for as long as possible. 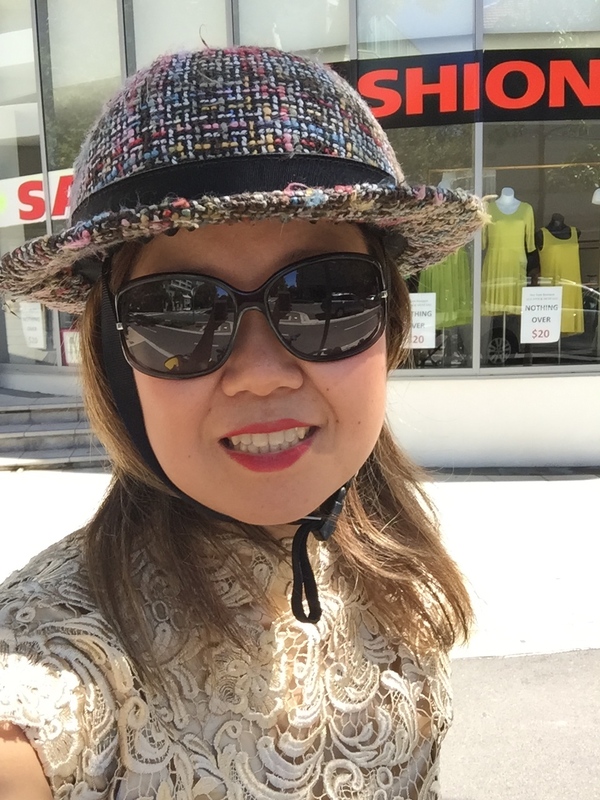 Today’s ensemble: Regina Garde lace top, Malena Birger wool shorts, Dior sunglasses, Yakkay helmet, Bruno Magli sandals, Nihola tricycle, Linus Eleanor Bag. On Julius: Baby Gap denim jacket, Nutcase helmet, Crewcuts shorts, Zara t-shirt. P.S. Please sign up to receive notification of new blog posts by leaving your email address. And I’d love to hear from you in the Comments. A special “Hi!” to all my high school friends who are following me. You know who you are! since you gave me your card, I’ve read several of your stories & have done lots of research on dutch cargo bikes. I have whittled my decisions down to either the Nihola 4.0 or the E Bakfiets Cargo. Just wondering what it was that made you choose the nihola over bakfiets & if you’ve had any problems with the conversion to electric? My husband was advised by a close friend (who’d had a bad experience) that its best to buy a bike that is manufactured as an electric bike to begin with. I’m very interested to hear your thoughts on this. Also, how do you find the hills in Surry Hills? Do you go directly up & down Albion St & Fovaux Str, or do you take less steep streets? I am glad that you avoid the whole lycra thing, and wear whatever. I am a fat middle-aged male with no interest in clothing, and when I ride I wear whatever I was wearing before, generally shirt, shorts and boots. I don’t do the electric thing because I enjoy pedalling too much. I have a pocket full of coins and a bag full of tools and tubes to suit whichever bike I may feel like riding, so weight saving is not something I will be caring about any time soon. You ride in platforms and heels! Good on you! We can wave at each other from the opposite sides of the fashion divide. Super hilly. So much so that I have to stand up to pedal. My kids are 10 and 6 now that I have to make them walk up some of the hills now.